Who is Dee, and what is he doing? One brave author follows this tortured soul in a work of astounding complexity and perplexity. My Name is Dee is either a groundbreaking piece of science fiction with a unique language, style, and thought process, or it’s a rambling Babel of confusing non sequiturs and seemingly random episodes. This is a book that readers will either love or find frustrating—there is no room for the in-between. Robin Wyatt Dunn is a brave writer, one who seeks to emulate his literary role model, Kim Stanley Robinson. In doing so, however, he has put before the world a work of astounding complexity and perplexity. 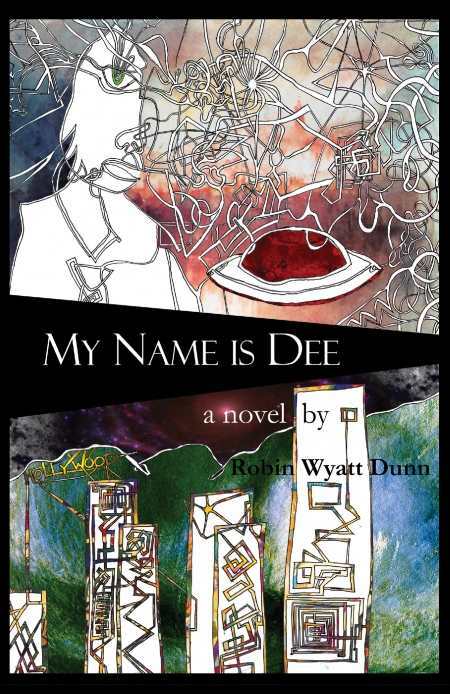 My Name is Dee has a plot and story, but it is not an easy one to find or follow. There is nothing linear about the story, which jumps about more rapidly than the aliens themselves. Dee is obviously a tortured and tormented soul, unsure of what to do and where to go, or of how to relate to his girlfriend, Sandra, a writer of science fiction who may serve as the author’s alter ego in the book. There are characters that speak in gibberish, rap, or Beat poetry (there is even a character called “Beat poet man”). The main character frequently speaks directly to the reader or responds to voices answering questions only he can hear. The result is a book inundated with non sequiturs, tangential diatribes, one-sided arguments, and references to people, places, and things that have no obvious or apparent connection to the book. Boethius of Byzantium, for example, may have been well known as an educator, statesman, and philosopher back in his day, but that day was over 1,500 years ago. A little exposition in places would really be helpful, but neither Dee’s character nor the author appear to be the helpful type.